Mp3 Normalizer is a software that attempts to maintain evenly the volume levels of mp3 files. The Mp3Doctor PRO has among its main duties is to be an mp3 normalizer, although additional ones as Ntenga equalize, change the tempo, change pitch, and so on. The idea is that in your mp3 files there are none that come on too strong or very soft sound, also avoids having very loud or quiet passages. So music playback mp3s will not have the jumps, or sudden drops or rises, but all remaining within a standard, that is what we call normalized. For Mp3 Normalizer we understand the type of software that remains within a range of volume to mp3s. Do not allow to rise beyond the upper limit, or to fall beyond the lower limit. That would be a good definition of an mp3 normalizer. For the common user normalize mp3 means making the volume of the mp3 is within some range, at the highest level possible, without ever reaching the distortion. Mp3 Normalizer is one of the new things in fashion that allows us to live more pleasantly. The Mp3 Normalizer is the software responsible for handling these mp3 files to get your volume levels are consistent and smooth sound. Mp3 Normalizer a very high peak softens and enhances the very quiet passages, making the song sound at all volume levels more even. 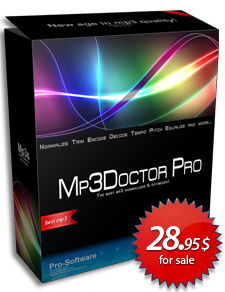 Mp3Doctor PRO uses the most advanced algorithm to normalize the mp3s. Analyze each of the 44.100 frame per second that contains an mp3. Enhances some frequencies, while other makes less noise. All this to achieve a balance that make every instrument is audible and that the song sounds the best possible volume without distorting. All modern Mp3 Normalizer should aim to achieve a real balance of sounds and frequencies. The Mp3 Normalizer allows your mp3s have different bitrates and samplerates, although the minimum levels considered high quality are a samplerate of 44.100 and a bit rate of 160.